Written by Irving Berlin. This ultimate festive song that remains one of the world's biggest selling singles of all time. Bing first sang this classic in the movie “Holiday Inn”. This song has been covered by countless of music artists worldwide. This annual Christmas crowd pleaser has been recorded over and over but Nat King Cole's 1946 original recording of Mel Torme's tune is still the ultimate version of this old favourite with his hot chocolate voice. You just want to wrap up warm, hold your loved ones in your arms and sip eggnog and gobble chestnuts. The tune is already the most-recorded holiday tune of the 21st century. Phil Collins, Sting, George Michael, Boy George, Bono, the all-star list goes on and on. This charity classic has become a festive anthem and yet still serves up poignant lyrics about a world many of us know little about, and people we should champion and consider every year at this time. The King crooned this Billy Hayes tune up a storm for his Christmas With Elvis EP in 1958 and it has been a chilly reminder of lonely yules ever since. The track has been recorded by 150 different artists but Elvis gives it an achingly cool twist. This holiday classic has been recorded by over 1,000 different artists but only Doris Day takes you off to the imaginary lanes and meadows in this festive favourite, where young lovers build snowmen, fall in love and warm their frozen bits by the fire. 7. Last Christmas - Wham! George Michael's smooth tones and those Christmas bells offer us another festive heartbreaker as the British pop star recalls a romance gone bad. 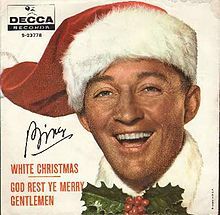 There's something about Dean Martin that just says Christmas to me - whether it's those lovely sweaters he used to wear, his love for a festive brew or the fact he's the eternal merry maker, I'm not sure but this jolly tune about keeping your loved one loved up as the storm bears down is a lovely romantic pop ditty. Another Christmas favourite that joins the one thousand club - for the amount of times it has been performed by different artists, this dreamy ballad conjures up all that is good and right about Christmas time. Tony Bennett, Toni Braxton and The Carpenters have all recorded terrific versions of this winter warmer but the late Rosemary Clooney nailed it. This makes the list just because it was such an odd but wonderful pairing - spacemanBowieand old timer Bing, the voice of Christmas. The odd couple teamed up to record this hit in the late 1970s for a TV Crosby Christmas Special and Bowie swears to this day he has no recollection of the performance.